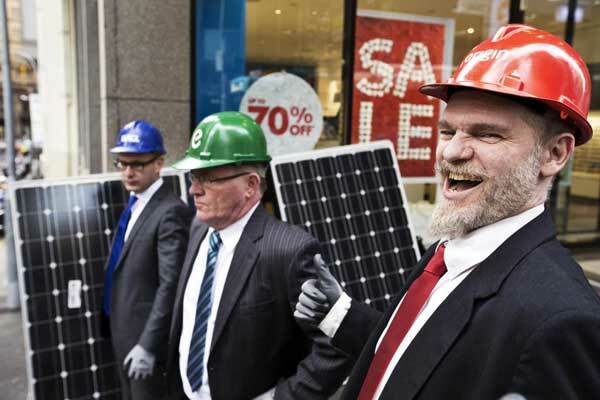 Do energy company executives really hate solar panels this much? This wasn’t what people on Sydney’s George Street were expecting to see on their morning commute. 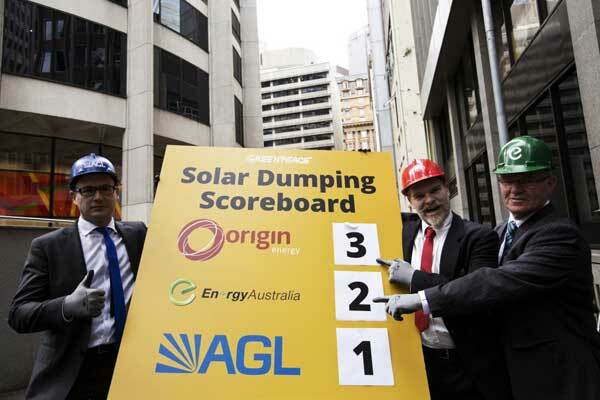 Three men, dressed as the CEOs of Origin Energy, AGL Energy, and EnergyAustralia, were surrounded by a crowd and TV cameras as they hauled a dozen solar panels into a dumpster while spectators booed them on. Seriously! Of course they weren’t the real CEOs. 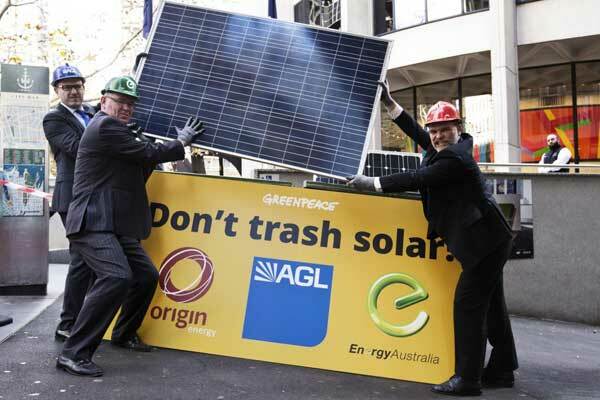 They’re a group of passionate Greenpeace activists staging of a mock solar-trashing contest outside the Sydney headquarters of Origin Energy. 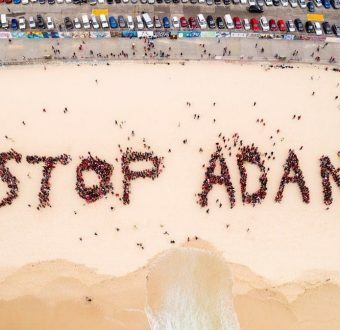 We were there to bring attention to the terrible things that these energy companies are trying to do to ruin Australia’s clean energy future. Analysis of company data by Greenpeace shows that renewable energy made up 0.5% of Origin Energy’s and 1.9% of EnergyAustralia’s electricity generation during 2012-2013. AGL Energy does a bit better, with around 15% of electricity coming from wind and solar. 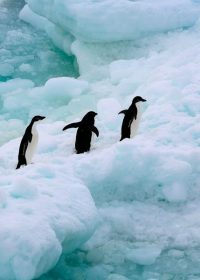 But in the last five years, its fossil fuel generation capacity has increased by 50%. By looking at infrastructure investment, we found that both EnergyAustralia and Origin Energy has ramped up their fossil fuel generation by a whopping 75% and 87% respectively. 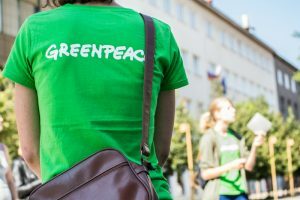 So while these companies are happy to spruik a clean-and-green brand, they’re working behind the scenes to undermine the Renewable Energy Target and protect their profits. This comes at the expense of a clean-energy future for Australia. They think they can get away with this by spreading misinformation about what the Renewable Energy Target is all about, claiming it’ll drive power bills up and create and less reliable electricity network for consumers. 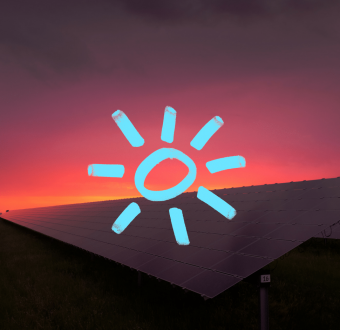 ButAs has been reported, Origin Energy and EnergyAustralia are slowing up paperwork renewable generators need to ensure they have customers for their power. Our stunt this morning and the report launch are just the beginning. We’re also building volunteer groups to strategically pressure politicians in key electorates, collecting names on a big petition to The Dirty Three energy giants, and raising funds to launch this controversial new TV ad. By scrapping the Renewable Energy Target, we’re falling behind the rest of the world. Australia already lags behind other large economies like Germany and China in developing renewables capacity. Meanwhile at home, billions of dollars worth of investments, power bill savings, and thousands of jobs are on the chopping block. 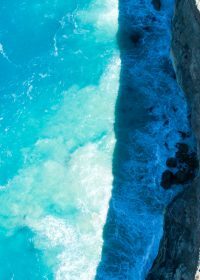 Australia is a country with plenty of wind and sun. It just makes sense to make the most of what we have and ensure we keep a strong Renewable Energy Target. If you agree, sign and share our petition to The Dirty Three today.